Everyone knows about Bermuda Grass or Cynodon dactylon which grows all over the world. Bermuda Grass or Durva Grass [Arugampul] has many health benefits and has been used in Ayurvedic Medicine in India for thousands of years for many ailments… and the juice is also called Arugampul juice in Tamil. Alkalizing – Durva Grass juice is great for alkalizing the body thus helping to prevent acidosis that eventually creates inflammation and then opens the door to the creation of disease. Detoxing – Durva Grass is a good detoxing agent, helps to cleans the liver and cells of the body and blood with chlorophyll. Anemia – Durva Grass juice contains over 65% chlorophyll and hence it has the ability to boost hemoglobin and red blood cell production, thus helping with anemia. 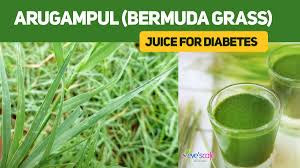 Diabetes – Juicing Durva Grass with a few Neem Leaves is great for lowering and stabilizing blood sugar… and Durva Grass juice by itself lowers and stabilises blood sugar. Great for Acidic Stomach and Indigestion – Durva Grass juice is great for lowering stomach acids thus helping with gastric ulcers, gastritis, and gastrolgia. Most people have seen dogs eating grass and there’s a reason why… it helps with GI distress. Diuretic – Durva Grass juice is a good diuretic helping to detox the body and get rid of excess water retention. And being a good diuretic it helps to flush out kidney stones and helps with urinary tract infections. Lung Problems – Durva Grass juice opens up the lungs and clears away congestion… making it great for colds, flues, asthma, and bronchitis. Stops Bleeding – Durva Grass juice stops nose bleeds, GI bleeding, helps with excessive menstrual bleeding, and more. Skin – Durva Grass juice rubbed on the skin helps with minor rashes, irritations, and a paste of Durv Grass stops the bleeding of skin wounds. Also boiling Durva Grass with coconut oil and licorice root for 15 minutes and applying to the skin helps with eczema. And Durva Grass paste mixed with turmeric powder works well for fungal infections. Hunger – Durva Grass juice helps those who suffer from constant hunger, thus helping with obesity. Contains – Durva Grass contains some crude protein, phosphorus and calcium for strong teeth and bones, potassium for water regulation and heart health, manganese for enzyme production, plus fiber for creating a good environment for probiotic growth in the colon (if the whole plant is consumed). Antioxidants – Durva Grass contains Vitamin’s A and C which are great antioxidants that prevent cardiovascular disease, strokes, and cancer. Also palmitic acid like that found in coconut oil which helps with atherosclerosis. Making Juice – Take a large amount of washed Bermuda Grass tops without the roots and add coconut water or filtered water and juice in a wheat grass juicer. Drink the juice first thing in the morning, and do not eat anything else for a couple hours to make sure the juice has a chance to do its job without being diluted. A wheat grass juicer works well for juicing Bermuda Grass. Alternate Method of Making Juice – Durva Grass juice can also be made by using a regular blender and then straining the juice through a fine strainer or cheese cloth. Add a little honey or stevia if you like the juice sweeter, but fresh Durva Grass juice is very refreshing and tasty by itself. Powerful Mixture – Durva Grass juice mixed with a little fresh turmeric and a little honey or stevia is a powerful, refreshing, and soothing drink. Dose – Drink at least one large glass of Durva Grass juice daily as needed on an empty stomach.